This Second Edition of the international best-seller "GPS--Instant Navigation", mariners will find simple solutions to navigational problems, including modern GPS accuracy standards and expanded chapters on Electronic Charting and trouble-shooting. Kevin Monahan is a retired Canadian Coast Guard officer with over 20 years' experience cruising the Inside Passage. Douglass has logged over 150,000 miles cruising from 60°N to 56°S. Includes 150 detailed diagrams, which graphically illustrate the many ways you can use GPS to solve classic piloting and navigation problems. 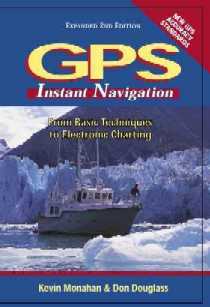 This book introduces the novice to the basics of instant navigation and carries him to advanced techniques of error reduction, electronic charting, and navigation software. The authors have witnessed the steady increase in capability of GPS technology and, after years of excellent performance, initial frustrations have given way to feelings of awe at its simplicity and accuracy. In describing techniques which allow a navigator to achieve high performance from GPS, we have tried to maintain a tie to traditional navigation techniques, yet capture the simplicity and responsiveness of GPS navigation. We have both considered it a challenge and a privilege to be able to develop some of the techniques described in this book, and to share them with each other when our blue-water paths crossed, as well as now, with you the reader. It's not often you get something for nothing, but in this case, the incredible improvement in the accuracy of the satellite system comes at no extra cost to the user. As of midnight May 1, 2000 every GPS receiver in the world suddenly became more accurate, and more useful to the boating community. Unassisted GPS can now compete with the accuracy of Differential GPS (DGPS) but, despite its phenomenal new accuracy, the differential GPS service still offers valuable enhancements where accuracy and reliability are critical. Clearly GPS is an emerging technology. With the introduction of a second civilian frequency in 2003, which will all but eliminate atmospheric propagation errors in the next generation of consumer GPS receivers, and with further improvements in the system beyond that, boaters can look forward to unparalleled navigational security. CHAPTER 1 GPS Navigation Works! Why Use a Nautical Chart? COG and Heading Vectors . Sidebar: Keep Those Paper Charts! Sidebar: GPS/Autopilot Interfaces in Small Vessels: The Devil’s Work?